Point Pleasant’s Caitlin Peal (13) maintains control of the ball between Williamstown defenders Katie Pickering (7) and Isabelle Erb (21) during Tuesday night’s girls soccer match at Ohio Valley Bank Track and Field in Point Pleasant, W.Va.
POINT PLEASANT, W.Va. — Leave it to the surname “Cook” to take one for the team right smack dab in the stomach. That’s because Point Pleasant sophomore goalkeeper Monica Cook came up with the save, and undoubtedly ultimately the play, of the match on Tuesday night. In stopping a sharp point-blank shot right in the proverbial breadbasket by Williamstown’s Lilly McMullen, Cook collected one of her three key saves — and helped preserve a scoreless soccer tie between the Lady Knights and visiting Yellow Jackets inside Ohio Valley Bank Track and Field. It happened with just 20 seconds remaining in the opening half, as a diving Cook caught the McMullen rocket right below her jersey number on the right side of the net. It was Williamstown’s — or even Point Pleasant’s — prime opportunity at a tally, as the Yellow Jackets outshot the Lady Knights 7-4, including 4-2 on goal. Cook made three saves for the Lady Knights and Mara Rinehart recorded one for WHS, as the only other noteworthy statistic was three Yellow Jacket corner kicks — all coming in the opening three minutes and 10 seconds of each half. Truth be told, while the Lady Knights’ offense was lacking, it was a superb defensive performance by Point Pleasant, as Williamstown was a 4-2 winner in the two clubs’ initial meeting on Sept. 7. The majority of the match was played either between the 20-yard lines or along the respective sidelines — with limited action in the midfield. 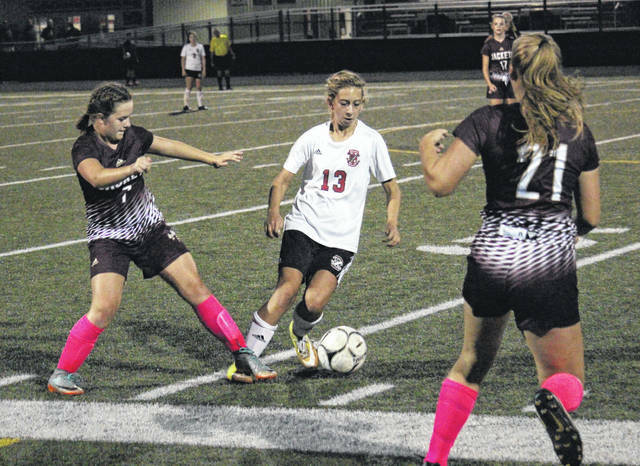 However, the offensive attacks — particularly Point Pleasant’s —started stretching towards the goalbox areas as the game grew longer late in the second half. All four of the Lady Knights’ shot attempts occurred in the final 40 minutes, as Lexi Watkins-Lovejoy and Morgan Miller managed tries around the 30-minute mark, while Teagan Hay had the two shots on goal inside the final 14-and-a-half minutes. Hay had one final late charge up the left side with a minute left, but her attempt was wide left to keep the scoreless tie. Williamstown went wide right with a shot by Katie Pickering with 32:18 remaining, as the Yellow Jackets tried desperately to take advantage of a failed Cook clear. Had that attempt not sailed wide, it would have been a goal, as Pickering caught Cook out of position and the upper and lower right-90s were left open. With similar season records, as the Yellow Jackets are now 6-7-3 and the Lady Knights now 4-8-3, there could be a third meeting between the two —which would take place in the upcoming Class A-AA sectional tournament. But first, the Lady Knights are idle until Monday night — when they return home to face Lincoln County at 7 p.m.